Frequently I hear, “I’d love to have a Prius but we couldn’t fit” or “It wouldn’t be practical”. Let me tell you, I put three carseats across the backseat in ours and it works just fine. The trunk is roomy and hauls around strollers, boxes, even dogs when needed. The back seats fold down in a 60/40 split, for those times when I have a child + things to haul. Our family does a lot of country road driving, so our Prius averages about 45 mpg. When we spend time in the city, we are in the 55-60 mpg range. It’s also a wonderful feeling to pull into a gas station (once a week tops) and pay $17-$20 for a fill up. Compare this to the larger vehicle which gets about 12 mpg and runs $50-60 per fill up and I want to cringe. Being a one car/no car family is the ideal, however we live in a tiny exurb about 20 miles out from the city center. For us, public transportation isn’t an option because the lines have not been extended to our town, the transit doesn’t even send the old clunker buses out this way. Walking isn’t an option either, we are six miles from the nearest store (which is a tiny market), 12 miles from any larger store (and for those of you hard cores thinking we could do that walking or biking, let me remind you these are dangerous, mountainous, curvy roads with no shoulders or walk paths). Now, we could certainly make the decision to move into the city, but we do not feel that is in the best interest of our children and their need for outdoor spaces. Living in the city also brings up many other issues such as the power grid, public water and sewer systems, and poorer air quality. So for now, we are staying in our exurb and loving it. We will continue to drive our Prius for all commuting needs and all those trips when five people or less are out and about. We are thrilled to only put about 6000 miles a year on our larger vehicle (and we are looking for ways to create a lower carbon footprint when transporting seven people). For all you naysayers out there, grab the carseats and give the Prius a test drive. Two carseats fit very well, when I add the third it gets a little difficult to buckle them all in. To me, that’s a minor inconvenience. 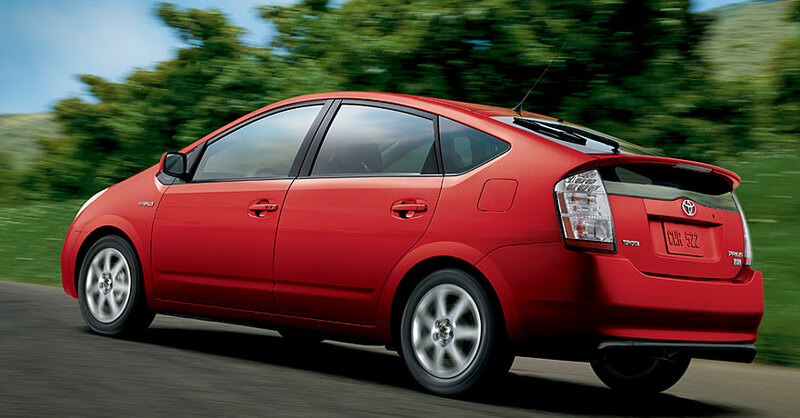 You may be surprised to discover a Prius will work for you after all. In the interest of enlightenment… We are a one-car family of four that chose to live in a community where my husband can walk to a commuter train to travel 20 miles to work. When we can’t walk, we drive a minivan to enable us to carpool whenever possible. On excessively cold, snowy or rainy days (most of the school year! ), I drive three other neighborhood children to school. When we go out with friends or family in the area, we drive one car. I appreciate your sharing the versatility of a Prius. But please don’t be so quick to judge other families. There are many different ways to be gentler to our planet. I applaud *everyone* who makes an effort, and continue to look for ways we all can improve. It’s a bit harsh to bring this up, but a major factor is that two-thirds of adults and one-third of children in the U.S. are overweight. While my own family of 5 can ride in my economy car and in my mom’s Prius, it is only possible because we are all at a healthy weight. If we were like many other families out there we’d be simply too fat to fit. I’m so glad to see this! Can you tell me which carseats you are using? We are a prius family and I’m pregnant (planned even!) with #3 and I have been bummed about having to get a new or used giant gas guzzler. But I was wondering which car seats you use. Thanks in advance! We also own a Prius and are expecting #3. I’m curious to see which 3 seats you used as well. We’re planning on buying Radian’s for my 3 and 4 year olds and a Chicco KeyFit 30 for the baby. According to the following website, it’s possible to get 3 across that way. There are not many car seats out there that are narrow enough to fit 3 across. I love our Prius !